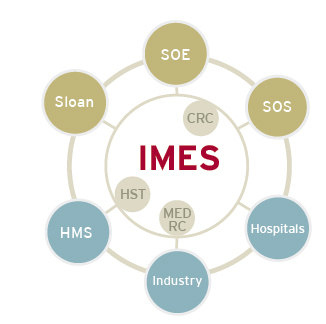 IMES aims to accelerate innovation across a spectrum of activities that span discovery, design, and delivery of new medical devices and products. A robust home for the Harvard-MIT Health Science & Technology (HST) program, which has a rich history of educating leaders in medicine and health-related technologies. A crosscutting strategic challenge involves unsustainably rising healthcare costs. The cost of healthcare is growing at rates higher than the GDP in many countries, and currently constitutes 18% of the US GDP. Bending this cost curve is imperative. Medical innovation has extended and enhanced the quality of human life, yet it has not been fully leveraged to enhance value and reduce costs. IMES, in partnership with MIT, industry and hospitals, has initiated efforts in this area. IMES is confronting these clinical challenges by bringing together, and enhancing, MIT strengths in devices, imaging, computation, big data, regenerative medicine, drug delivery, technology transfer, and entrepreneurship. Partnering these strengths with those in local area hospitals/industry is expected to be transformative for advancing human health.